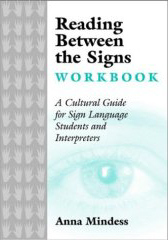 In conjunction with the October release of a new 3rd edition of my book Reading Between the Signs, the publisher and I decided to make available as a FREE Ebook, the companion Workbook which was published several years ago. 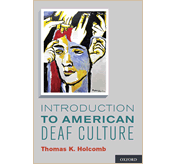 Directions: Read the statements below and decide if they describe an attitude more often found in mainstream American (hearing) culture or in American Deaf culture. Put an H (for hearing) or a D (for Deaf ) in the spaces provided. ______ 1. Sharing personal information benefits us all. ______ 2. The “grapevine” shows people care about each other. ______ 3. Name-dropping is pretentious. ______ 4. Graphic descriptions of bodily functions and surgical procedures often make people uncomfortable. ______ 5. Describing your ties to well-known community members can demonstrate your trustworthiness. ______ 6. Stories regarding your own and others’ illnesses and medical treatments are important to share. ______ 8. Softening a critical comment often makes it easier for the other person to accept. ______ 9. If you can’t say something nice, don’t say anything at all. _____ 10. Some topics (such as money and bathroom habits) are off-limits in polite society. _____ 11. You owe it to your friends to inform them if a new hairstyle is unbecoming. _____ 12. If you have a criticism, tell it straight. Draw lines between pairs of sentences above that express opposite messages.You should end up with six pairs. 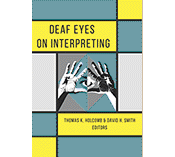 Please share this free resource with any ASL, Deaf Culture or Interpreting instructors that you know. Thanks!! 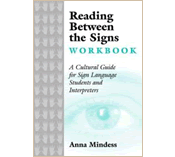 Posted in Deaf Culture Values, Deaf/hearing cultural differences, Resources for ASL and Deaf Culture Instructors and tagged Anna Mindess, deaf/hearing cultural differences, politeness, Reading Between the Signs Workbook. Bookmark the permalink. Here’s a new web TV channel that highlights Deaf and hearing cultural differences. First installment: a Deaf man asks too many “personal questions” to a hearing woman he just met. It’s in “international sign” with English captions. 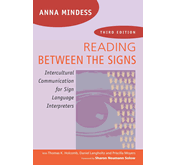 Posted in Deaf/hearing cultural differences and tagged deaf/hearing cultural differences, international sign. Bookmark the permalink.